Truly Christian unity is the beautiful state of brothers dwelling together (Psalm 133 v 1); people of every tribe and tongue united through the cross of Christ as one people calling on one Lord, shouting his salvation for eternity (Ephesians 2 v 16; 1 Corinthians 1 v 2; Revelation 5 v 9-10; 7 v 9-10). The main way we are able to express this unity is in our local churches. And while that may sound obvious, it doesn't make it easy to do. Our sinful desires can lead to division, bickering and fighting, even amongst our closest brothers and sisters. There is also a wider unity worth fighting for. There’s a wider church with whom we should be “eager to maintain the unity of the Spirit in the bond of peace” (Ephesians 4 v 3). From Acts to Revelation, we see again and again how interconnected and interdependent the early church was. We see how it was invested in, and respectful of, one another’s mission enterprises; how happy it was to give and receive resources and workers, and how concerned it was to maintain unity in the gospel in order to work together for its advancement. Praise God that there are signs of that kind of unity today! There are examples up and down the country of generous, outward-looking churches and networks working together. We thank God for the unity that he has graciously given within Co-Mission and the strong friendships he has given Co-Mission with other gospel-hearted brothers and networks. Let’s not take that for granted. And let’s be eager to nurture that unity. Because unity, particularly at a regional level, is a pretty rare jewel. When we look across the conservative evangelical scene, it is easy to get confused by the incredibly complex array of factions, movements and initiatives. We could get disheartened by the fractured relationships that can exist between these groups as they overlap, intersect or rub up against one another. And in amongst them, we can find personality politics at work, duplication of efforts and conflict over resources. So how do we rediscover the jewel of unity? How will gospel people in London “work together for the truth” (3 John 1 v 8) to reach this city in a way that is more Biblical, Christ-pleasing, Spirit-led, beautiful, happy and effective? In times when the ground feels hard, conversions few and congregations contracting in many places, it is easy to develop a “survival mind-set”. And a survival mind-set breeds competitiveness and contentiousness. We become anxious, defensive and prickly. But at the beginning of Luke 10, Jesus says, “the harvest is plentiful”. Instead of planning for maintenance mode or scaling down (thinking we need fewer workers, shutting down training institutions), Jesus says to plan for growth. 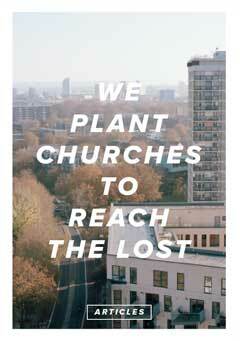 There is a vast harvest, so we need thousands more workers and hundreds more churches. There is more to do than any of us can do as one church or even one network. (Luke 9 v 49) - other groups, denominations, church tribes and circles. Those who we will be tempted to condemn and scorn. Jesus wants us to pray with a Kingdom-vision – there is only one harvest field and it belongs to the Lord. the harvest is His and the workers are His. The first rule of conflict resolution is active listening. “Everyone should be quick to listen, slow to speak” (James 1 v 19). It is easy for us to make assumptions about other groups. Each church network and movement has a particular story, direction, and culture. It takes time to stop and listen for their perspective, but it makes a great difference. If we labour to get to the point where we can express what someone else’s perspective is, in a way that they recognise, then we can see what are the real points of agreement and disagreement are. We can understand how they relate to other organisations and ourselves. And we can begin to grow a relationship, simply because we are listening. The New Testament letters show that there was not only listening going on in the early church, there was also a lot of open, warm and serious communication taking place. 2 Corinthians shows the lengths to which Paul would go to explain his ministry, clear up misunderstandings and bring about restored relationships. The greetings at the end of all the letters reflect a need to keep communicating – “We do not want you to be uninformed” (2 Corinthians 1 v 8). There is obviously a range of tone in the letters, some sharply rebuking heresy while others overwhelmingly positive encouragement, but it is striking that they were designed to be “open letters”, circulated and read by all the churches. There was a need for all to be “in the loop”, aware of the issues and in agreement, not only on doctrine but in many practical areas. While there are, of course, times for discretion and confidentiality in our church today, this sort of frequent, frank and warm communication will be hugely important in building relationships and co-ordinating church planting. Andy Harker is a researcher in church planter training, currently moving forward discussions around a Church Planting Academy with church planting networks in London.